The Computer Doctor offers service contracts to Wiregrass area businesses. As your IT support, your business can count on us to take care of technological needs. From cell phones to computers, websites to networking, and time clocks to employee badges, we cover every aspect of your IT demands. The Gold Service Contract is our most popular contract. For a flat rate each month, we cover your hardware, backup, website hosting, antivirus protection, and other IT services for no additional charge. Plus, businesses are guaranteed new computers every three years. The Silver Service Contract provides your business with many of the services of the Gold Service Contract; however, charges are determined on a time-ratio-per-computer rather than an unlimited-time ratio. Coverage on each PC is not as inclusive. 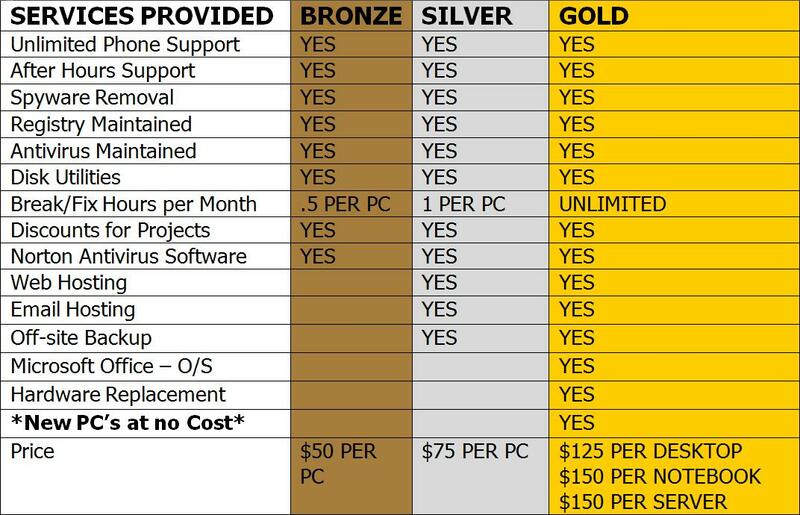 The Bronze Contract also offers a portion of the Gold service contract and charges are determined on a time-ratio-per-computer on this contract. If you have any questions about any of the contracts, please feel free to call us at (334) 673-4921. Ask for Keith, Candice or Aubrana. Our business is your business IT! !